Directions: Questions 1 to 5 are based on the following data. 1. In 1990, the total revenue for widgets sold was about how many times as great as the number of widgets sold? 2. . In 1970, if the cost to produce one widget was $0.07, what would have been the total cost to produce the number of widgets sold during that year? 4. . In how many of the years shown was the number of widgets sold at least three times the number of widgets sold in 1960? 5. . Which of the following statements can be inferred from the data? I. The greatest increase in total yearly revenue over any 10-year period shown was $7 million. II. In each of the 10-year periods shown in which total yearly revenue increased, the average number of production hours per widget decreased. III. 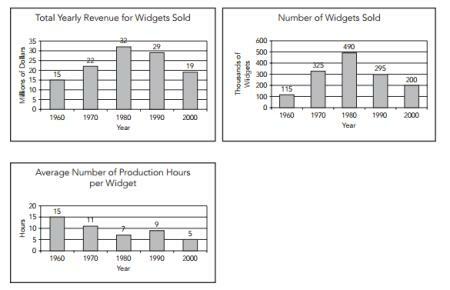 From 1980 to 1990, fewer widgets were sold because each widget took longer to produce. 7. 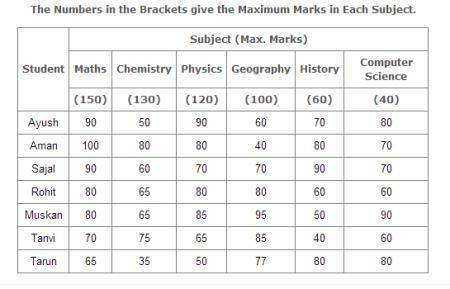 The number of students who obtained 60% and above marks in all subjects is? 8. What was the aggregate of marks obtained by Sajal in all the six subjects? 9. In which subject is the overall percentage the best? 10. What is the overall percentage of Tarun?